Not to be confused with Blackburn Rovers L.F.C..
For the South African football club of the same name, see Blackburn Rovers FC (South Africa). Blackburn Rovers Football Club /ˈblækbɜːrn ˈroʊvərz/ is a professional football club in Blackburn, Lancashire, England, which competes in the Championship, the second tier of the English football league system, following promotion from League One at the end of the 2017–18 season. The club's motto is "Arte et Labore", "By Skill and Hard Work" in Latin. The club was founded following a meeting, at the Leger Hotel, Blackburn, on 5 November 1875. The meeting was organised by two young men, namely John Lewis and Arthur Constantine, two old-boys of Shrewsbury School. The purpose of the meeting was "to discuss the possibility of forming a football club to play under Association rules". The first match played by Blackburn Rovers took place in Church, Lancashire on 18 December 1875 and was a 1–1 draw. On 28 September 1878, Blackburn Rovers became one of 23 clubs to form the Lancashire Football Association. On 1 November 1879 the club played in the FA Cup for the first time, beating the Tyne Association Football Club 5–1. Rovers were eventually put out of the competition in the third round after suffering a heavy 6–0 defeat by Nottingham Forest. On 25 March 1882 the club won through to the final of the FA Cup against the Old Etonians. 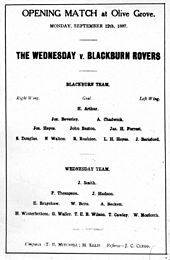 Blackburn Rovers was the first provincial team to reach the final, but the result was a 1–0 defeat by the Old Etonians. Rovers finally won the FA Cup on 29 March 1884 with a 2–1 victory over the Scottish team Queen's Park. The same teams played the FA Cup final again the next season, with Blackburn Rovers again emerging victorious, with a 2–0 score. Rovers repeated this success yet again the next season, winning the final replay 2–0 against West Bromwich Albion. For this three-in-a-row of FA Cup victories, the club was awarded a specially commissioned silver shield. 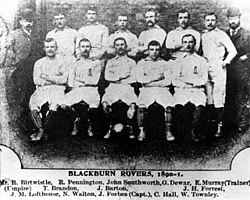 Blackburn Rovers again reached the FA Cup final on 29 March 1890 at the Kennington Oval. The club claimed the trophy for the fourth time, by beating Sheffield Wednesday a hefty 6–1 with left forward William Townley scoring three goals and becoming the first player to achieve a hat-trick in the FA Cup final. 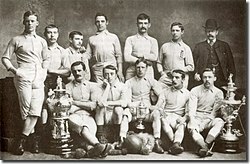 The 1890–91 season saw Blackburn Rovers win the FA Cup for the fifth time against Notts County with a 3–1 victory. During the 1897–98 season the club stayed in the first division only as the result of a decision to increase the number of teams from 16 to 18. The season did, however, mark the beginning of Bob Crompton's 45-year association with the club, both as a player and eventually as an FA Cup winning manager. In November 2010, the Indian company V H Group bought Blackburn Rovers under the name of Venky's London Limited for £23 million. The new owners immediately sacked manager Sam Allardyce and replaced him with first-team coach Steve Kean, initially on a temporary basis, but by January 2011 he had been awarded a full-time contract until June 2013. Kean's appointment was shrouded in a great deal of controversy since his agent Jerome Anderson had earlier played a major role in advising Venky's during the takeover of the club in the preceding months. At the start of the 2012–2013 season, Steve Kean, the manager in charge for the previous relegation season, was given a chance by owners to win promotion and kept his job as the manager. Ultimately though, pressure from the supporters who had been calling for the manager's removal for months resulted in his resignation as manager on 29 September 2012. On 24 April 2018, they were promoted back to the second tier with a 1-0 win at Doncaster Rovers. Through its history the club has adopted four badges as its crest; the Maltese Cross, the towns coat of arms, Lancashire Rose and the present day Blackburn Rovers Badge. From 1875 to approximately 1882 The Maltese Cross was present on the club's first ever home kit and was worn by both the Shrewsbury and Malvern school teams. Two former Malvernians and two former Salopians played in that first team, so there is a clear link with these public schools. During FA Cup finals it is tradition for the club to adopt the town's coat of arms as their badge. This tradition has carried through all eight FA Cup finals the cup has been a part of all the way to their last FA Cup final against Woverhampton Wanderers in 1960. Still adopting cricket grounds, the committee acquired the use of the East Lancashire Cricket Club's ground in the centre of the town, Alexandra Meadows. Sources differ as to the date of the first match played by Rovers at Alexandra Meadows. A programme from Clitheroe F.C. states that Clitheroe was the first team to beat Blackburn at Alexandra Meadows on 17 November 1877. Other sources indicate that the first match took place on 2 January 1878 with a Blackburn victory against Partick Thistle. It was on this ground Blackburn Rovers played for the first time under artificial light against Accrington on 4 November 1878. ^ "Nicknames". Club Nicknames. The-Football-Club.com. 2 August 2009. Archived from the original on 7 September 2009. Retrieved 2 August 2009. ^ "Top 10 most successful English football clubs revealed: Liverpool, Man United and more!". talkSPORT. 8 October 2014. Archived from the original on 20 September 2016. Retrieved 15 June 2016. ^ "Martin Tyler's FA Cup stats: Omens for Arsenal v Aston Villa". Archived from the original on 3 August 2016. Retrieved 15 June 2016. ^ Pierce, Jimmy (23 October 2013). "Blackburn didn't buy the Premier League title in 1995 – they earned it". The Guardian. Archived from the original on 16 June 2016. Retrieved 15 June 2016. ^ "1875–1884: The early years". rovers.co.uk. 2 July 2007. Archived from the original on 9 March 2009. Retrieved 1 July 2011. ^ "Blackburn Rovers 1875 – 1914". Archived from the original on 4 July 2014. Retrieved 21 July 2014. ^ a b "History of Blackburn Rovers". 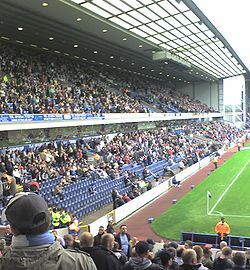 Ewoodpark. Archived from the original on 5 November 2013. Retrieved 5 November 2013. ^ "Forest 6 Rovers 0". Sportsdatabase. Archived from the original on 5 November 2013. Retrieved 5 November 2013. ^ "The Encyclopedia of British Football Football Association Challenge Cup". Spartacus. Archived from the original on 14 May 2014. Retrieved 6 November 2013. ^ "Oldest-known FA Cup final programme expected to fetch £25,000 at auction". The Guardian. Archived from the original on 3 December 2013. Retrieved 6 November 2013. ^ a b c "Blackburn Rovers: Pre Football League FA Cup; Football League; Past Season's History". Ewood park. Archived from the original on 5 November 2013. Retrieved 6 November 2013. ^ "Blackburn Rovers Football Club History". Football dictionary. Archived from the original on 18 October 2015. Retrieved 6 November 2013. ^ "History of the Football League". football-league.co.uk. 22 September 2010. Archived from the original on 9 February 2009. Retrieved 1 July 2011. ^ "1890 FA Cup final". Friends reunited. Archived from the original on 6 November 2013. Retrieved 6 November 2013. ^ "On this day in sport". Daily Mail. UK. 29 March 2008. Archived from the original on 26 October 2012. Retrieved 1 July 2011. ^ "Winners of FA Cup". FA Cup. Archived from the original on 6 November 2013. Retrieved 6 November 2013. ^ "Football League". Funtrivia. Archived from the original on 25 October 2013. Retrieved 6 November 2013. ^ "History of Jack Walker". The Guardian. 19 August 2000. Archived from the original on 5 March 2017. Retrieved 11 December 2016. ^ "Kenny Dalglish at Blackburn". The Independent. 23 August 1996. Archived from the original on 21 June 2017. Retrieved 19 September 2017. ^ Sport, Ian Singleton BBC. "How Kenny Dalglish turned a six-game losing run into glory". Archived from the original on 24 October 2018. Retrieved 13 February 2018. ^ "Shearer set to sign for Blackburn". The Independent. 27 July 1992. Archived from the original on 10 May 2009. Retrieved 19 September 2017. ^ "League standings at the end of 1992/93 season". premierleague.com. Archived from the original on 2 June 2013. Retrieved 18 August 2012. ^ "League standings at the end of 1993/94 season". premierleague.com. Archived from the original on 2 June 2013. Retrieved 18 August 2012. ^ "Blackburn honours and picture of the Premier league winners team". rovers.co.uk. Archived from the original on 3 November 2012. Retrieved 18 August 2012. ^ "Dalglish and Blackburn part company". The Independent. 22 August 1996. Archived from the original on 21 June 2017. Retrieved 19 September 2017. ^ "Champions League group standings 1995/96". uefa.com. Archived from the original on 25 September 2012. Retrieved 18 August 2012. ^ "Roy Hodgson had big stars at Inter Milan but he handled everything thrown at him". The Daily Telegraph. 2 May 2012. Archived from the original on 22 July 2018. Retrieved 3 April 2018. ^ "Hodgson out as Rovers hit bottom". The Guardian. 21 November 1998. Archived from the original on 27 September 2016. Retrieved 11 December 2016. ^ "A nice guy who came last". The Guardian. 4 November 1999. Archived from the original on 27 September 2016. Retrieved 11 December 2016. ^ "Blackburn sack Kidd as pounds 30m investment fails". The Independent. 4 November 1999. Archived from the original on 21 June 2017. Retrieved 19 September 2017. ^ "Souness takes the reins at Blackburn". The Guardian. 14 March 2000. Archived from the original on 27 September 2016. Retrieved 11 December 2016. ^ "Blackburn Rovers owner dies". BBC Sport. 18 August 2000. Archived from the original on 26 January 2011. Retrieved 19 August 2012. ^ "Blackburn sign Cole for 8 million pounds". The Daily Telegraph. 29 December 2001. Archived from the original on 22 July 2018. Retrieved 3 April 2018. ^ "Cole strike stuns Spurs – Blackburn won the League Cup". BBC Sport. 24 February 2002. Archived from the original on 7 December 2008. Retrieved 16 August 2012. ^ "Souness takes Newcastle job". BBC Sport. 6 September 2004. Archived from the original on 24 October 2012. Retrieved 16 August 2012. ^ "Blackburn appoint Hughes". BBC Sport. 16 September 2004. Archived from the original on 5 December 2013. Retrieved 16 August 2012. ^ "Paul Ince Rovers New Manager". Rovers official website. 22 June 2008. Archived from the original on 27 September 2008. ^ "Exciting times to come – Warnock". BBC Sport. 23 June 2008. ^ "Ince appoints Knox at Blackburn". BBC Sport. BBC. 7 July 2008. Retrieved 23 August 2008. ^ "Club Statement". Blackburn Rovers FC. 16 December 2008. Archived from the original on 17 December 2008. ^ "Rao family buy Blackburn Rovers from Jack Walker Trust". bbc.co.uk. BBC. 19 November 2010. Archived from the original on 5 March 2012. Retrieved 19 August 2016. ^ "Blackburn Rovers sack manager Sam Allardyce". BBC Sport. 13 December 2010. Archived from the original on 12 January 2016. Retrieved 18 December 2010. ^ "Steve Kean signs new Blackburn Rovers contract". BBC. 20 January 2011. Retrieved 19 August 2016. ^ Conn, David. "How an agent came to hold so much power at Blackburn Rovers" Archived 25 December 2016 at the Wayback Machine, The Guardian, 21 December 2010. Retrieved 19 August 2016. ^ Hytner, David. "Steve Kean finds value of friends in high places at Blackburn Rovers" Archived 27 September 2016 at the Wayback Machine, The Guardian, 16 December 2010. Retrieved 19 August 2016. ^ "Blackburn Rovers board's dismay at Venky's conduct revealed in letter". The Guardian. 15 January 2012. Archived from the original on 2 February 2017. Retrieved 11 December 2016. ^ "Venky's stress commitment to Blackburn despite £18.6m pre-tax loss". The Guardian (UK). 28 December 2011. Archived from the original on 19 December 2013. Retrieved 5 January 2012. ^ "Blackburn Rovers relegated after defeat by Wigan – CBBC Newsround". Archived from the original on 10 May 2012. Retrieved 16 August 2012. ^ "Steve Kean 'forced to resign' as Blackburn Rovers manager". Archived from the original on 16 October 2018. Retrieved 13 February 2018. ^ "Doncaster Rovers 0-1 Blackburn Rovers". BBC Sport. 24 April 2018. Archived from the original on 25 October 2018. Retrieved 24 April 2018. ^ "First Team 2018-19". Blackburn Rovers F.C. Archived from the original on 28 May 2017. Retrieved 27 August 2018. ^ a b c Kelly, Andy (4 October 2017). "ARSENAL MANAGER HASN'T WON AS MANY FA CUPS AS BELIEVED". The Arsenal History. Archived from the original on 4 October 2017. Retrieved 4 October 2017. ^ "Rovers welcome new Head Coach". Rovers.co.uk. Archived from the original on 23 February 2017. Retrieved 22 February 2017. ^ "Rovers return to Umbro". Blackburn Rovers official website. Archived from the original on 5 June 2016. Retrieved 2 June 2016. ^ "Rovers agree deal with Dafabet". Blackburn Rovers official website. Rovers.co.uk. Archived from the original on 24 May 2015. Retrieved 14 June 2015. ^ a b c d e Mike Jackman, 2009, Blackburn Rovers The Complete Record, The Breedon Books Publishing Company Limited, Derby. ^ "Alexandra Meadows Ground Profile". England Football Online. Archived from the original on 29 September 2013. Retrieved 12 December 2013. ^ "1875 – 1884: The early years". Blackburn Rovers F.C. 31 January 2012. Archived from the original on 15 December 2013. Retrieved 12 December 2013. ^ "Player by Team by Year Overall". PremierSoccerStats. 25 October 2008. Archived from the original on 7 December 2008. Retrieved 25 October 2008. ^ Ltd, Statto Organisation. "Blackburn Rovers scoring and sequence records - Statto.com". Archived from the original on 13 November 2010. ^ "English Premier League 2011–2012 Table". statto.com. Archived from the original on 17 December 2013. Retrieved 16 December 2013. Wikimedia Commons has media related to Blackburn Rovers F.C..